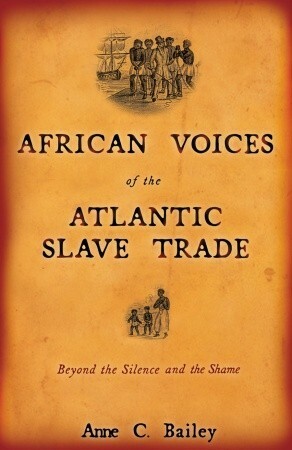 This book is an excellent examination of how local African History remembers the slave trade. Previously the majority of the slave trade has been examined, interpreted and remembered through the records left behind by white plantation owners, slave traders, British ministers and abolitionists. Very little has been done to examine contemporary African records (principally because they are so difficult to get hold of, especially since many of them are part of the verbal tradition of many of the west coast tribal groups). Anne Bailey's book (originally her PhD thesis) takes steps to redress this imbalance and examine the African perspective to understand how the trade was perceived from the shores of west africa rather than the shores of the new world. This book does read like a PhD thesis so its probably not the best initial introduction to the Trans Atlantic Slave trade but for the more indepth researcher this is an asset and an excellent introduction to another set of source material. For the type of book it is this is an amazing book. That is to say that so far I have not come across a book like it in its genre, the amount of research and dedication it took to create this book is amazing. Since it came out still nothing has changed on the denial of Slave Trade in Africa nor the repriation and rememory that countless generations and people need so badly. I highly recommend this book to anyone whether they have an interest in the history of slavery, the history of Africa, history globally or an intrest in humanity. I read this book for a class on Violence and African History. While it gives a good account of the African side of the Trans-Atlantic Slave Trade, it can be a bit hard to follow. So many events are taking place and it isn't always easy to ascertain in which time they are occurring. There is also an issue if you are not complete familiar with Ghana and the communities which inhabit it; a small primer might be best. Here as part of the slavery spiral. On the whole I found this very informative, but I have to confess I found the writing a bit unclear in places. I wondered if this was written before The Slave Ship (I think that was the title) because I was surprise that wasn't in the bibliography. Interesting book but assumes a fair amount of prior knowledge, so not a great introduction to the topic. The fallout and perceptions from the other side of the imperial system that still plagues Africa.